This is considered very cold for this time of year, deviating from the norm by 13–16 degrees. At the end of last week in southern Siberia, daytime temperature dropped from 0 to −20°C. An interesting phenomenon was observed – the reverse daily temperature variation, when it is warmer at night than during the day. During the weekend the cold intensified. On Monday morning in the suburbs of Krasnoyarsk, the thermometer dropped to –36°C. In Evenkia, the first 40°C of the season was recorded. What next for U.S. climate and energy policies? The climate is now in at the crossroads and we are going to see and find out which way it goes very soon. I feel it is happening but I need more of the items below to make a more definitive turn before my confidence can really increase. For my money I think it is the geo/solar magnetic field strengths and if they weaken enough and stay weak I think the result will be a major climatic impact to colder conditions. 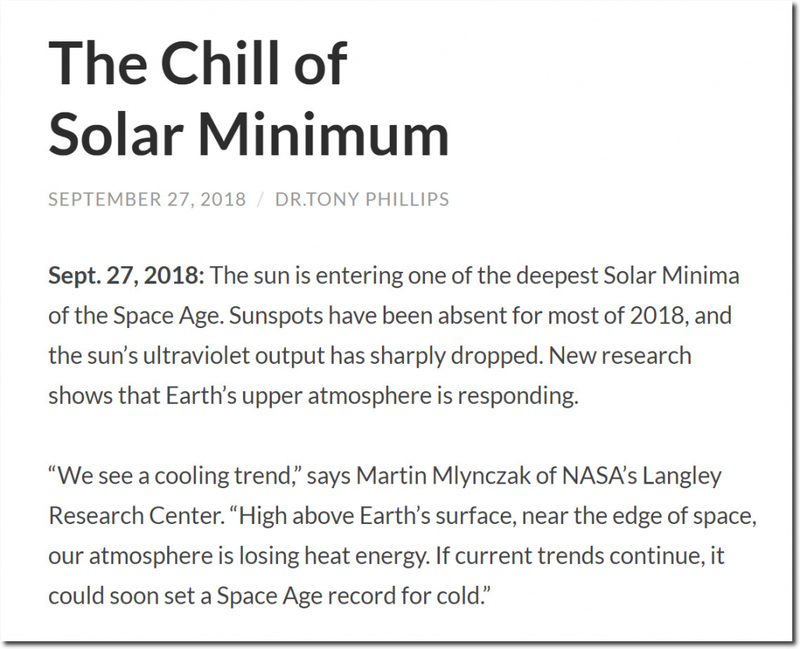 Time will tell but the potential is as higher now then any other time since the Dalton Solar Minimum ended which was in 1850. Look at the predicted temps for Mexico for Wednesday 11/14/18. Most of the country will be in the 20s F. This is very unusual even in the winter. The reaction of the “scientists” is precisely what one would expect. After all, what could the people who live around polar bears possibly know about the animals? I’m waiting for a wall to be built on our “northern” border to keep the illegal imagrants out trying to head south. This will be because of bitter cold, fuel and food shortages. Climate refugee’s……you only have 1 more year…and i’ll be escaping south….retirement can’t come soon enough! A time-lapse video from residents of Krasnoyarsk catches the arrival of one of the first snow storms over the city. In the middle of the day a snow tsunami came, turning the temperature from 3C to -6C in a few hours. Winter will bring much harsher temperatures but for now see the dramatic arrival of snow blanketing the surrounding mountains then blotting our the city. On social media people wrote that it resembled the Game of Thrones, namely the appearance of white walkers – the army of the living dead. Further north in the same Krasnoyarsk region is the Arctic city of Norilsk. Here resident Demian Bulavinets caught the natural seasonal phenomenon of ‘light pillars’ . This is a harbinger of winter. In Norilsk, it was already down to -25C. This is an atmospheric optical phenomenon in the form of a vertical band of light appearing to reach above or below a light source. It is caused by tiny ice crystals suspended in the atmosphere or clouds. Did you all see the news that in June, Antarctica set a new low temperature record… very nearly as cold as is theoretically possible to reach on this planet. If it could reach that low of a temperature at ~410 ppm CO2, how much lower would it have reached at the baseline ~280 ppm CO2? 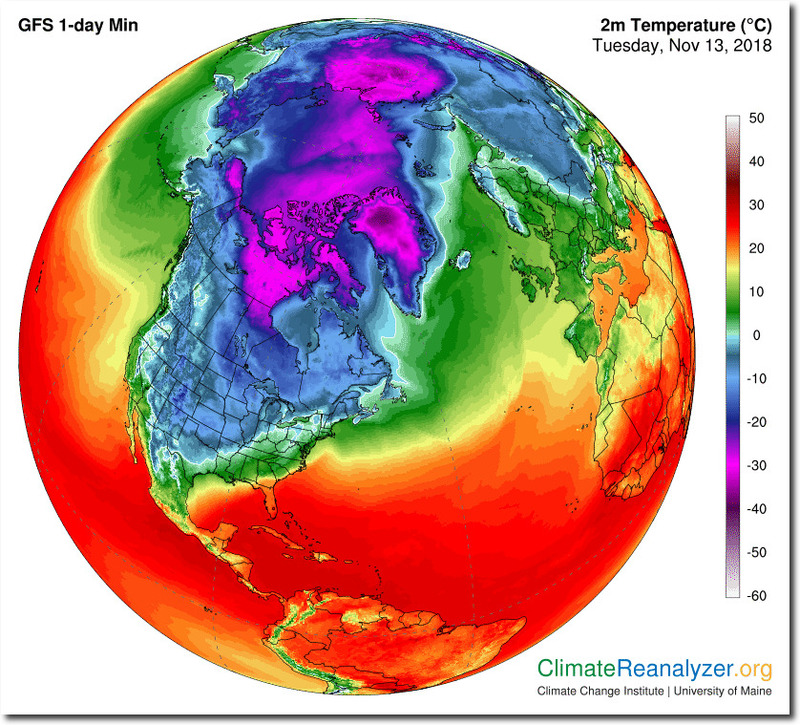 Well, zero degrees lower…. because CO2 does not and cannot cause Gorebull Warming. Even a cursory study of physics proves this via several avenues. The heat capacity of a single CO2 molecule (at atmospheric surface temperature and pressure) absorbing a 15-micron photon is 6.135 x 10^-23 joules/K, which is smaller than the amount of energy of that 1 photon (1.325 x 10^ -20 joules). Therefore, the CO2 will immediately give up that energy via emission relaxation or to other molecular constituents of the atmosphere via collisional relaxation. Those other collisionally-excited molecules, however, are also excited by photons of other (shorter) wavelengths, and those other molecules emit at far higher photon energy (and thus a far higher corresponding blackbody temperature). Thus an increasing CO2 concentration acts as a “pump” for 15-micron radiation, transferring that energy to other molecules which emit at higher energies. One of the largest constituents which receives this 15-micron energy from CO2 is water vapor… and it emits smack-dab in the middle of the Infrared Atmospheric Window… those emitted photons have a nearly unfettered path out to the infinite heat sink of space. Thus, an increasing CO2 concentration actually causes cooling, not warming. There are several peer-reviewed studies proving this. How the Klimate Katastrophe Kooks can continue denying science is beyond me. Perhaps this is why we’ve witnessed the fastest temperature decline on record over the past 3 years (we’re currently only 0.396 F above the 1981-2010 mean and falling fast); we just had the coolest global average temperature for September in the last 10 years; the oceans are cooling rapidly at all depths; the atmosphere has contracted more than ever now than over the past 43 years, causing space junk to remain in orbit as much as 50% longer than originally planned (ironically blamed on CO2); we’re experiencing record cold temperatures everywhere, and the Klimate Katastrophe Kooks have to rely upon falsified data to keep up their “warmest day / week / month / year ever” screed.